A black soybean is called a black soybean by one of the kinds of the soybean. The face is a black because it contains the pigment of the anthocyanin family in the skin of the seed. Elements other than the anthocyanin are thought to be an almost equal to a usual soybean. A black soybean boils as for food and is used. It is an indispensable one for dish "Special New Year's food" at the New Year. Because boiled beans can be preserved for several days, it is suitable as the special New Year's food. Sweetness is contained so as not to wrinkle the surface, it is quite difficult to boil softly, and time and time hang. Therefore, when it is used that it is sold to put it in packing in the state of boiled beans, I think many. The coloring matter of the skin with a black black soybean is chiefly an anthocyanin. 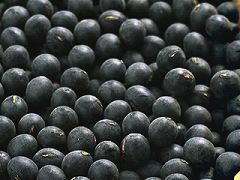 This is a kind of the polyphenol, and a good element in the health of eyes like the blueberry. It is said it is effective in a reduced visual acuity and a variety of eye disease prevention. Moreover, beauty, the aging prevention, and the blood vessel are made strong, and there is an effect of often doing circulation of the blood because there is an antioxidative effect that removes the active oxygen in the anthocyanin, too. Additionally, minerals such as the lecithin of a peculiar element to the soybean, the saponin, the soy isoflavone, etc. magnesium, and calcium and the vitamin groups are abundantly contained. Please add and subtract the amount of the material according to the favor. The amount becomes suitable if it always makes it. Water: Two liters and water evaporate while boiling and decrease a little. Sugar: The amount is added and subtracted by 500g-1kg and the favor. The citric acid: The amount is added and subtracted by 20-30g and favors. It sells it to the drugstore. First of all, a black soybean is often wet-cleaned. A black soybean is put in the boiling hot water, and it boils down for about 15 minutes. A black soybean is removed, it puts sugar in, and it melts it by the low flame. Afterwards, the citric acid is put. It puts it in the bottle and the PET bottle, etc. straining it with gauze and the cooking paper after it naturally cools it. The stock solution that can be done is cooled with the refrigerator and preserved. It thins to about five times by water and it drinks. You may moderately put ice and cool it. It is possible to drink delicious even if it divides with the soda water. It is sweet, acid, and the delicious one. It becomes a transparent purplish red color if the citric acid is put, and it makes a mistake as the grape juice. Mysteriously, there is no taste of the bean. A black soybean will be boiled later and be made boiled beans. 2-3 seeds are sown to a field and a direct planter. Let's thin out when growing. Next, the soil is drawn to the foundation of a black soybean, and the rooting from above is urged. The prop is put up, and the pea plant is prevented from falling because of the typhoon etc.If anything doesn't do agricultural chemicals, it is eaten messily due to the damage of the stinkbug. You will control it with agricultural chemicals. If it is a kitchen garden level, it takes it by the hand. Because water is necessary so that the flower may bloom (the middle of August - the middle of September), the bean moderately does the watering. When frost gets off and the leaf withers, the leaf is removed. It reaps afterwards, it dries, and it makes it only to a black soybean.